Short version: August is a Filipino triathlete who used to work as an ice delivery boy on the bike. This brought him to professional cycling, then he was part of the Duathlon National Team and later inspired by Chrissie Wellington he learnt swimming and started to do triathlon. August was born on August 2, 1984 in Paniqui, Tarlac (Philippines). He is second eldest of a low-income family of eight brothers and sisters. His childhood was difficult in the daily struggle of his family to survive. Therefore, as a young boy August already started to contribute to the family’s income. Throughout elementary and high school, August helped his Dad, who worked as an ice dealer, to deliver ice to clients. He did this every morning before school and then again in the afternoon. When he was about 12 years old, he assembled his first bike from parts bought from junk shops. Then he attached a side car and used it to deliver almost a thousand kilos of ice every day. Beside the support to his Dad’s business, the ice delivery also meant a lot of “training” on the bike, although he did not realize it nor call it “training” at that time. It was simply his work. But this work was the reason why from very young on, August had a rather athletic physique and well developed leg muscles. When he was about 14 years old, he was invited to join the track and field events at school. At the age of 15 he won his first medal wearing a pair of borrowed shoes that were too big for him. The following year he started to join successfully numerous running events. He realized very quick that he was made for longer distances. He could do well in 800m or 3,000m runs, but it was in the 5,000m and 10,000m races where he usually won over his opponents a couple of laps ahead. It was only a matter of time before he started training for bigger goals, the “Palarong Pambansa”. But his dream to participate in the Philippine National School Games did not come true. His school had to cancel his participation because of lacking funds. It was a huge disappointment and temporary setback, but August continued his training as he felt that there were more challenges ahead. In 2003 he joined his first duathlon with a borrowed mountain bike. He finished 10th to the last. He realized that while his running skills were good, it was on the bike were he lost too much time. August decided he needed a road bike and more focus on bike training. He was happy when he found out that a friend was selling an old bike. It was a heavy steel-frame bike, but it was his first road bike he bought on installments. He negotiated a deal with his friend and was able to pay on a monthly basis, 1,000 PHP per month for 6 months. This meant a lot of extra work for him. He was restless delivering ice in the morning, attending school, training, helping his father again to go to the ice plant in the evening. Unlike most of his classmates, he never spent any money in school for food or entertainment. He kept every cent he could to save up for the bike payments taking extra jobs during the weekend. Finally he was able to pay off his friend after only 4 months. Beside his work and school he spent as much time as possible on the bike. One day when he was out on the bike a car sideswiped him and he came off the bike. While August was lucky to get away with some minor bruises, his bike rims were twisted irreparably. He felt inconsolable, but the guilty and worried driver bought him new rims. So in the end, that was his first bike upgrade! August also started joining local cycling events. In 2004 he joined a qualifying cycling race for Tour Fedex (which is Ronda Pilipinas today) from Batangas to Tagaytay. He finished 46th in the 2nd elimination which qualified him together with 84 other cyclists for the Fedex Tour. For the first time his name was mentioned in the local papers and a couple of weeks before the start of the Tour, he was selected by Team Beer Na Beer. Until today, August feels that he was very lucky because his captain was Victor Espiritu and with a lot of effort and team work, his team finished second in the Tour Fedex 2004. This was just more motivation for him to push harder in training and invest more hours into it. He also became more confident and saw a chance to make money with sports. In 2005 pushed and supported by his friend, Sir Aldrin Balex, he tried again the duathlon. He raced and beat members of the Junior Duathlon National Team. The Philippine Sports Commission (PSC) decided to take him in as part of the team. As part of the National Team, he also started to have a well organized training and his programs were prepared by the national coach, Melvin Fausto. 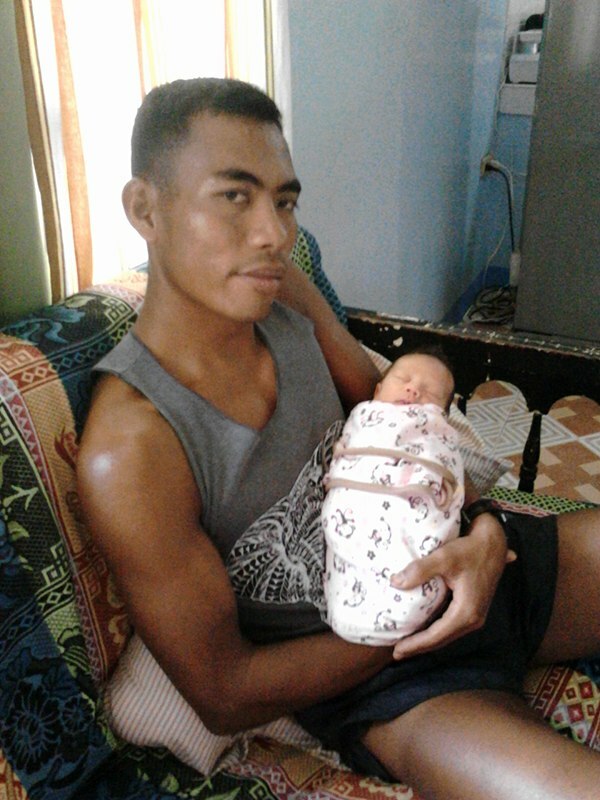 The following year, August was sent to Thailand to race in the Mekong River International Multisports Festival, an Asian-wide duathlon event where he won gold in the 20-23 age category. It was during this event, that August met the first time Chrissie Wellington, the British triathlete and later 4-time Ironman World Champion. August and his team mates told Chrissie about some multisport events in the Philippines and invited her to come to their country for racing. In 2007 Chrissie Wellington indeed visited the Philippines for a race and a couple of weeks of training. Chrissie was based in Clark just like August and his team mates Jeff Valdez, Ana Liza Desanco and Ryan Mendoza. They started to train together and Chrissie and August soon became friends. In fact, it was Chrissie who first encouraged him to try triathlon. Chrissie learnt about August’s poor background and even visited his family one time during a bike ride. She pushed him to triathlon because she knew there were better chances to win some money. August liked the idea until he realized – triathlon included swimming! So the thing was, he could not swim. On top of that, he had a childhood fear of drowning due to an incident that happened on the beach when he was about 10 years old and he almost drowned in the ocean. He was nervous about swimming in deep waters, but he decided to overcome his fear and start to learn swimming. From 2007 onwards, while still doing the workouts of the Duathlon National Team, he started to go to the pool and practice whenever he could manage to squeeze it into the already busy training day. 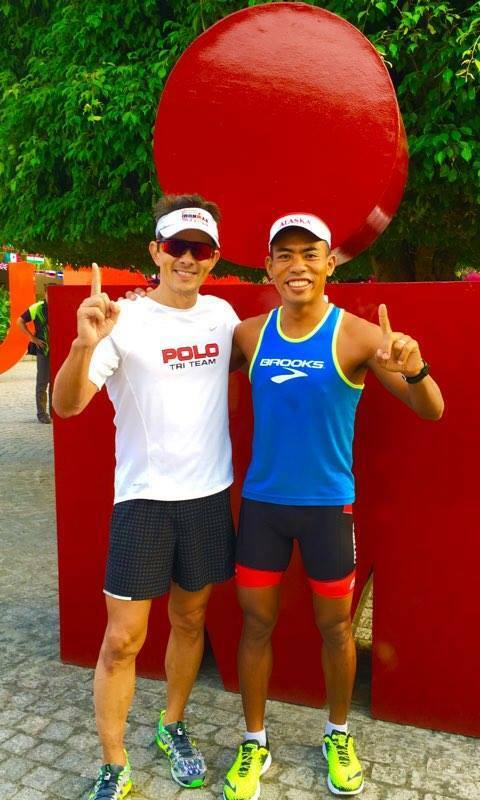 Meanwhile, he continued to perform well in national duathlon events and the same year, the PSC and the President of the Triathlon Federation, Sir Tom Carrasco, decided to give him one of only two slots the country had to represent the Philippines in the duathlon event of the South East Asian Games (SEA Games). In preparation for these games, August as well as some of his teammates, were sent to Phang Nga, Thailand, for training. They joined the TBB training camp and it was there when August met Team TBB and Chrissie Wellington’s coach, Brett Sutton. On one of the first days, Sutton asked August if he could swim. August answered positive and was asked to show his skills . He managed to get from one side of the 25m-pool to the other, put with huge effort. He continued like this through 500m, then Sutton finally relieved him from that and asked him to get out of the pool and buy two chopping boards. August obeyed and the next day presented two chopping boards to the coach. Sutton prepared the chopping boards as paddles putting holes into the boards and rubber bands. He also glued two pull buoys together then gave both “toys” to August and asked him to swim. It was hard, and August was wondering about the purpose. But after a couple of days, he started to feel some changes and the chopping board exercise actually helped to improve August’s swimming in mini-steps. Nevertheless, August was sent there for duathlon preparation, so he could only follow the “special swim training” whenever he had a short break in-between his real training sessions. August still is excited when he thinks back to this time. In this camp he met a lot of international top Pro athletes, some of them later became World Champion, like Chrissie Wellington, Nicola Spirig, Belinda Granger, Matt O’Halloran, Reto Hug, Reinaldo Colucci. But what truely most impressed him were Brett Sutton’s training methods and programs and the fact that this coach, after only seeing him a short time, already predicted that he had a chance in long distance triathlons. The preparations in Thailand worked well and when August finally joined the SEA Games, he did the country proud and brought home the bronze medal. The same year during a duathlon event back home, he was introduced to Czar and Rachel Manglicmot from the Philippine Maritime Institute College (PMI). The Manglicmot Family saw the potential in August and decided to support him. He eventually became part of Team PMI and also raced for the team in some relays. In 2008 only after a couple of months of swim training, he was ready to try his first triathlon. He joined an Olympic distance race in Camiguin Island. Today he still remembers that it felt as if he would die in the swim. In fact, his coach told him to stop after the first lap. But August told himself to get through it and would not stop. For him it was simple, if he could not finish this race, he would not have any chance in triathlon. So he got through it, and it was more about mental strength and praying to God than physical fitness. The same year, Chrissie Wellington returned to the Philippines together with her coach Brett Sutton. They set up a Team TBB Training camp in Subic Bay for two months. August as a member of the Duathlon Team was based in Clark at that time but when he learnt about the camp and that he was allowed to join their training, he decided on his own to rent a small room in nearby Olongapo in order to participate in their sessions. As recommended by Brett Sutton, August also joined the ITU Long Course Race in Subic Bay that year. The 4km swim was the most challenging part for him, but once he got through it, the 120km bike and 30km run seemed easy and he managed to finish 6th overall. This race was like a breakthrough for August because he realized that indeed, he could race triathlons. In 2009 the big announcement in the Philippines was the first ever Ironman 70.3 that was going to take place in the province of Camarine Sur. Team PMI organized a team participation and also registered August for this first event. As part of the preparation for the race, the Manglicmot Family decided that August had to work on a proper swim technique and started to sponsor swimming lessons for him. August raced the first time on the 70.3 distance in the Filipino Elite category. After the swim, the Filipino lead pack had 14 minutes on him. For some people that might seem hopeless, but August did not give up but raced hard on the bike and run and finally finished 4th Filipino, less than one minute behind the 3rd placed and only 2 minutes behind the leaders. He also continued racing duathlons with the National Team and the same year he started training with coach Pedrin Pedrigosa. At that point it was clear that August still had more chances in the duathlon. His bike was already very good, so coach Pedrin encouraged him to focus more on the run. In 2010 he was sent back to Thailand to participate in the Mekong Duathlon Asian Cup. Thanks to the improved run, he performed very well and finished 3rd overall and 1st Asian. That year he went back to Camsur to race the Ironman 70.3. He had not had a lot of time to focus on his swimming but he still finished 3rd Filipino but had actually entered Age Group category, which he won. In 2011 he continued racing in duathlon but started to put more focus on the triathlons. PMI continued sponsoring swimming lessons for him and he was able to improve his performance in triathlon. That year he was also happy to place 2nd Filipino Elite athlete at the Ironman 70.3 CamSur. Now euphoric about triathlon and again supported by PMI, he decided to enter the full iron-distance race Timex 226 in Bohol in December the same year. As usual he had a big gap to the leader after the swim but putting up best bike and run split of the race he finally placed 2nd overall. As everyone who ever finished a full iron-distance triathlon knows, the race was a huge effort and stress for his body. Today August knows that he was not very well prepared for the distance. He could race and finish it because of his physical fitness and mental strength but his training had not been totally appropriate. Additionally, he had squeezed in other races before that, too. But August raced for money, his motivation is and has always been to help his family so he went for any race where he saw a chance to make some cash. Only two weeks after the 226 together with his friend Rakin, he enter the adventure race Ibtor Challenge, a buddy-race that includes a 350m swim with pushing a banana tree trunk, an 11.9km off-road run, a 15km pedicab race and a 10km buddy run where August and Rakin finished 2nd place. After the 226 he had started to feel some random pain in his lower back but had not paid a lot of attention to it. After the Ibtor race, however, the pain got worse and he also started to experience a numb feeling in his legs. At times, August could not walk. He knew something was wrong but it was not until the next month that he took actions. With the support of PMI he finally consulted Doctor Eufemio in Manila and was confronted with shocking news: A severe injury in the lower back spine that already affected the nerve. August was devastated with the diagnosis. He needed treatment and stayed several weeks in Manila. PMI and the Manglicmot Family supported the treatments and took care of August. It was the beginning of 2012 and a very hard time for him. Some days he thought that he would never be healed and that his sports career was already over. Sometimes he thought that maybe his path was not to be an athlete, but to go back to his province and back to selling ice. But he never stopped praying to God and asking Him for strength and guidance. A couple of months earlier August had been approached by coaches Ani de Leon Brown and Dan Brown from Unilab Active Health to join their team. In the beginning of 2012 August and Unilab came to an agreement and August joined the Unilab Active Health Elite Team. He had insisted to remain part of Team PMI as well but Unilab became his major sponsor. He felt very lucky and thankful especially as he was still dealing with his injury and was not able to train or race. But he continued to get treatment and physical therapy, now also supported by Unilab, and started to become more hopeful, to feel better and to believe that he would overcome the injury. He still was not able to do any proper workouts. In fact, he was told not to run or bike, but was only allowed to swim. At that time he remembered coach Brett Sutton and one of his athletes that had also suffered a back injury and had been told by Brett Sutton to train in the water, not only for swimming but also to run in the water with a belt. The same year, supported by Czar Manglicmot from PMI, he moved to Subic. He was close to the Brent International School and the pool and started working out in the water exactly like he had seen it in Team TBB. He spent hours and hours in the pool for swimming and running. August did not race too much that year but he joined all the races of the triathlon series TriUnited organized by his sponsor Unilab and was able to finish podium in some of them. He also had entered again Ironman 70.3 Philippines but he had mixed feelings about it. He had placed 2nd the previous year but now was wondering if he would be able to perform well after his injury and training that mostly took place in the water. He had a lot of sponsors now looking at him and he felt excited and nervous at the same time. The race was moved to Cebu the first time and August had the chance to travel there a couple of weeks before the race and train in Danao. In spite of all the facts that spoke against him, he was decided to race at his best and he kept praying to God to give him strength. On race day as usual, he got out off the water far behind the lead pack but fought hard on the bike and just before T2 caught all the Filipino Elite athletes that were in front of him. His fast run made him keep this position and he was crowned the Filipino Elite Champion. He was overwhelmed, happy and indefinitely thankful to his sponsors, his family and the people that had supported him. But mostly, he was grateful to God. He knew it was Him that had given him the strength to get through the injury, the pain, the endless hours of training in the pool that at times had seem useless and through this race that had been so important to him. A couple of months later August raced Ironman 70.3 in Taiwan. The race itself did not go bad, but he had bad luck. The timing mat did not register his chip after the second swim lap and he was disqualified later on. Afterwards he found out that more athletes had experienced the same procedure. Nevertheless, this race meant another big impact on August’s life, because it was in Kenting, Taiwan, where he first met Juergen Zaeck, the German ironman legend who just about a month later became his coach. Juergen invited August to join the training camp at Thanyapura, Phuket, where he was coaching the triathlon department. In December 2012, with the support of Unilab and PMI, August traveled to Phuket and started training with Juergen. August stayed at Thanyapura for two months, with the main goal to improve his swim but also to get the experienced insider tips and training programs from Juergen for the bike and run. Until present he continues to train with Juergen and to visit Phuket regularly for training camps. In 2013 August raced a lot of events in the Philippines like TriUnited and some local races. Of course, he also raced again in Cebu attempting to defend his title in the Filipino Elite. This year he was not lucky, he had a broken shifter on the bike and had to struggle with this mechanical problem until he finished the bike leg. He knew he was far behind the leaders and even many athletes passed him on the bike, but he never gave up. He kept on praying and fighting. With his fast run, he was finally able to finish 2nd in the Filipino Elite. It was not what he had hoped and trained for, but there are things in the race you can not predict and he made the best out of it. The same year, because of his good performance in the ITU race in Subic, he was sent to the Powerman Malaysia Asian Duathlon Championships. He finished 7th overall and 2nd Asian. In 2014 there were even more triathlons in the Philippines and another international event on the schedule was the Challenge Philippines in Subic. August raced in the South East Asian Elite category and was able to finish first in a head-to-head competition with his training buddy from Phuket, Jaray Jearenai, the No. 1 Thai triathlete. He also ranked well among the international top pro athlete field. Like usual his big goal each year was to do well in the Cebu Ironman 70.3. In 2014 he was “only” 6 minutes behind the leaders after the swim and was almost able to close the gap on the bike, but finally catched the leader on the run and was able to claim again the Filipino Elite Champion title. He is very proud and thankful that God gave him the strength to win this race a second time and third time in 2014 and 2015 (read the 2015 Cobra Ironman 70.3 race report for more details). Only one month later with the support of his sponsors he was able to race the first time in Europe. August joined the Ironman 70.3 Zell am See in Austria. It was one of the hardest races he ever did. The extreme weather conditions, 17 degrees Celsius water temperature, 10 degrees Celsius air temperature, rain showers, made the race tough even for many of the numerous pro athletes that participated. Still August is thankful for the experience and lucky to have raced on a course that will host the Ironman 70.3 World Championships in 2015. Throughout the year, August participated in the TriUnited events and was able to claim the Champions title in the first ever TriUnited 3, an half-iron distance race at SCTEX. This win gave him important points that counted for the TriUnited Series were he was also awarded Champion (2014 & 2015). More details on all races 2015 & 2016 in race report under Lastest section. Early 2016 August signed up with a new sponsor, ALASKA Milk Corporation. Alaska has been a long time supporter of sports in the Philippines and a pioneer in triathlon bringing Ironman to our country (through Sunrise Events). As the Ironman 70.3 events are among the most prestige events in the world and the distance suits August well, this seemed like a perfect match to him. Additionally, for the past couple of year ALASKA has created a triathlon team including top-level international athletes and August feels honored to be part of this team. He is very thankful to Sir Fred Uytengsu and Ma’am Princess Galura for the great opportunity granted. In his life and athletic carrer, August is grateful that God is always protecting him, giving him strength and leading him into the right direction. He is thankful for the continuous support from his sponsors and feels blessed he has met so many kind people in his life that helped him or continue to help him in some way. August’s motto in life is “Never Give Up” and “Anything Is Possible If You Have God In Your Heart And Mind”. Inspiring story August! More power and mileage ahead. Keep inspiring people.